If you think that Nyood is just a fancy place for dinner I have news for you, they also do brunch! There's nothing like refreshing mimosas and Illy coffee to kick start your weekend. 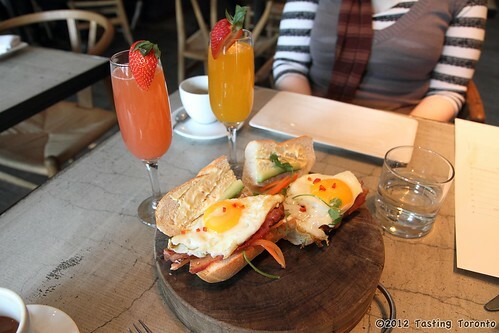 We had Strawberry & Lychee, and Mandarin Peach mimosas, featuring Moet & Chandon Champagne. Our coffees were an Americano and a Cappuccino, as they don't actually serve drip coffee. Interesting forced decadence. We started our meal with a Cobb Salad: hard boiled egg, bacon, lettuce, avocado, roast chicken, tomato, and St. Agur blue cheese. 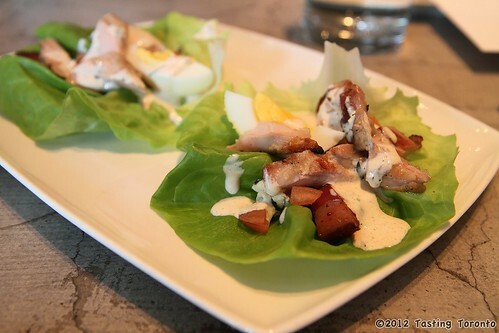 The salad was eaten Korean style, using the lettuce leaf like a taco shell. Next we had what looked like the most unique item on the menu, the Breakfast Banh Mi: Fried eggs, bacon, cucumber, chilli, cilantro, served on a baguette. That was very enjoyable. The fresh taste of the cilantro and cucumber contrasted nicely with the richness of bacon and eggs. 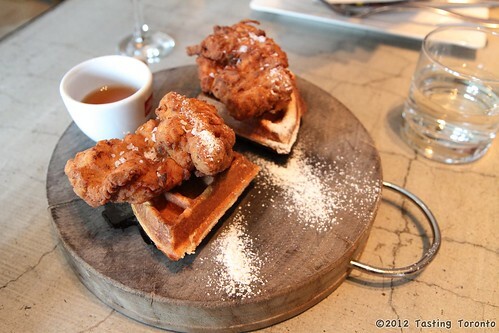 Moving up to a more substantial item, we had the Chicken and Waffles: Buttermilk fried chicken, maple chilli butter. That fried chicken was to die for. Crispy and juicy, with salty accents from the large-flaked salt crystals, it was succulently soft and pulled apart with the lightest touch. A little disappointingly, I found the waffles too firm. It had good flavour but it distracted from the goodness of the chicken. 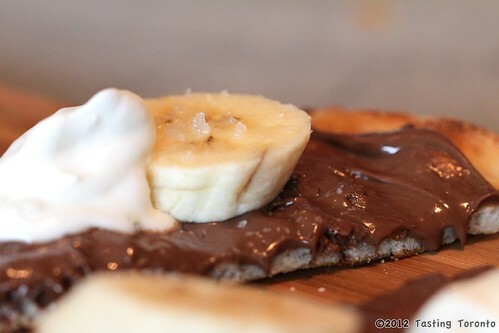 To finish everything off we had the Italian Breakfast Flatbread: Nutella, bananas, hazelnuts, Frangelico cream. 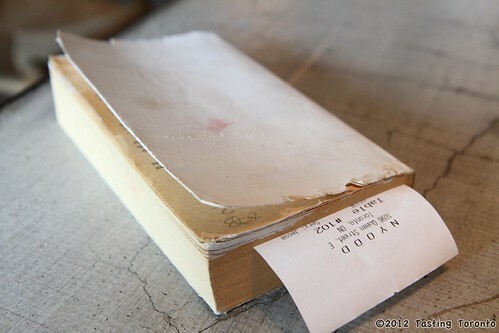 This is simple enough to easily be made at home, but I'm pretty sure it's still one of the more popular items. Who doesn't like Nutella? This next photo looks like a postcard. 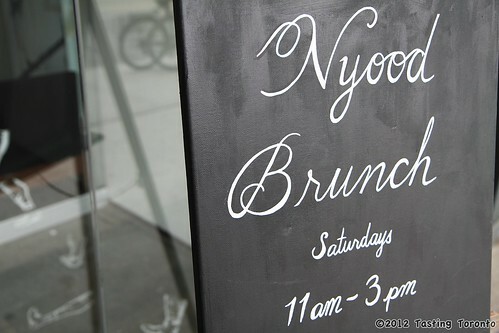 Nyood is a luxurious place to have brunch. They really pay attention to the aesthetics of your food and your surroundings. 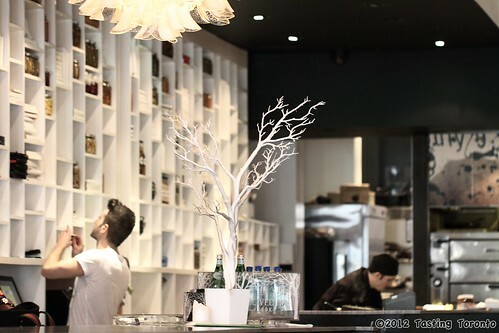 Here's an interesting concept: For those who don't want their Saturday night partyies to stop, Nyood hold's its Le Brunch parties on the last Sunday of every month, where folks can enjoy dancing and a $45 gourmet prix fixe. Yum! I didn't know they did brunch. That said, I've never been at all and been intending to for awhile. IVE ENJOYED MANY DINNERS AT NYOOD BOTH FOOD,SEVICE AND AMBIANCE IM SOOO EXCITED TO SEE WHAT THEYVE CONJURED UP FOR BRUNCH!!!! !